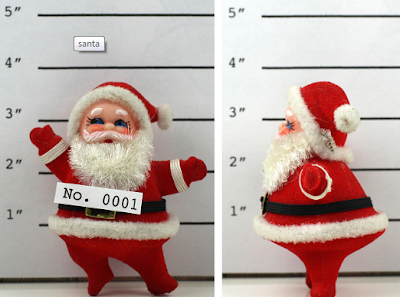 Welcome to Escola de Inglês - Air English School: Why does Santa look like what he does? Why does Santa look like what he does? 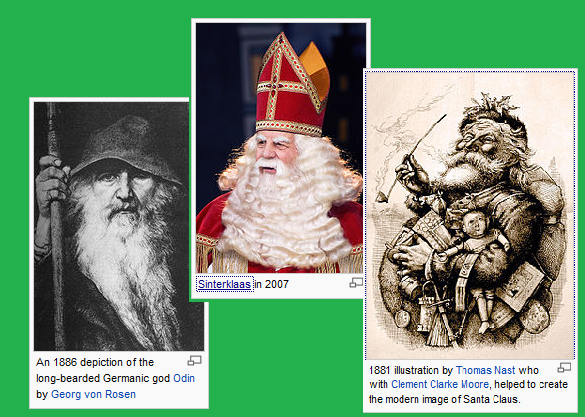 Santa Claus, also known as Saint Nicholas, Father Christmas, Kris Kringle and simply "Santa", is derived from the Dutch figure of Sinterklaas, which, in turn, has part of its basis in hagiographical tales concerning the historical figure of Christian bishop and gift giver Saint Nicholas. During the Christianization of Germanic Europe, this figure may have absorbed elements of the god Odin, who was associated with the Germanic pagan midwinter event of Yule and led the Wild Hunt, a ghostly procession through the sky. Over time, traits of this character and the British folklore character Father Christmas merged to form the modern Santa Claus known today. Santa Claus is generally depicted as a portly, joyous, white-bearded man—sometimes with spectacles—wearing a red coat with white collar and cuffs, white-cuffed red trousers, and black leather belt and boots and carries a bag full of gifts for children. Images of him rarely have a beard with no moustache. This image became popular in the United States and Canada in the 19th century due to the significant influence of Clement Clarke Moore's 1823 poem "A Visit From St. Nicholas" and of caricaturist and political cartoonist Thomas Nast. This image has been maintained and reinforced through song, radio, television, children's books and films.